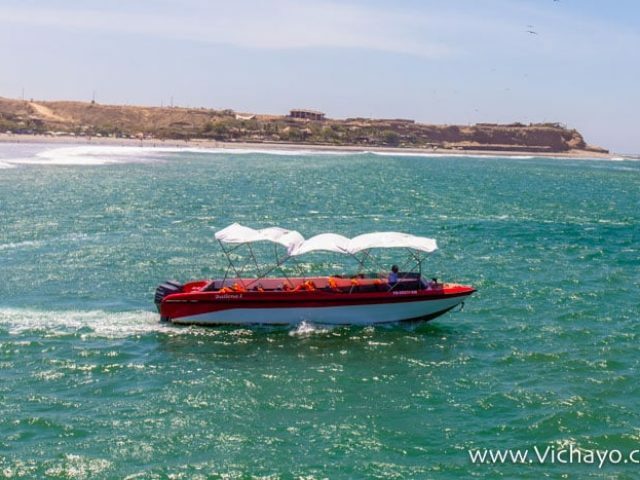 Whale Watching Season in Mancora and nearby beaches as Los Organos, Cabo Blanco and Punta Sal (Tumbes and Piura beaches) is one of the most incredible activities on the northern coast of Peru. Look closely at these gigantic animals, weighing several tons with docile and harmonious movements, it is one of those experiences that you will remember for a lifetime. 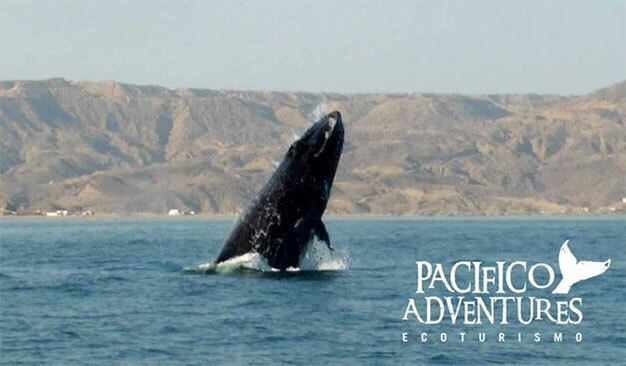 1.- Can you watch whales off the coast of Piura and Tumbes all year round? 2.- What kind of whales are? Are there other species of animals can be seen? 3.- Can you see whales right from the shore of the beach or its better to take a tour? 4.- What steps must be taken before boarding the boat? 5.- Have there been accidents between tour boats and whales? 6.- How long does it take the full tour? 7.- Which tour operators offer the whale watching tour service? No. 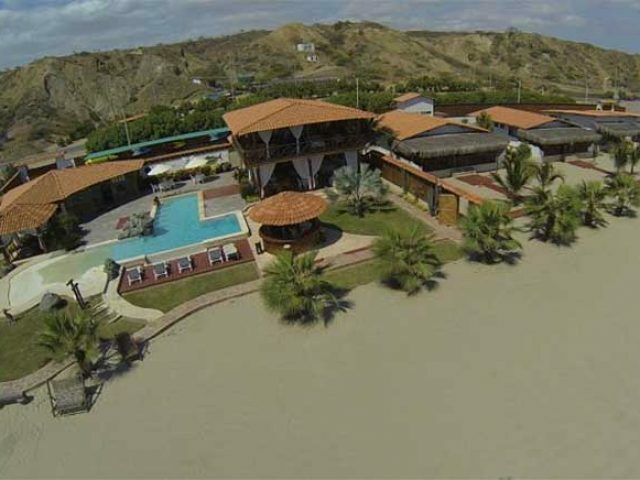 The whale watching season in Mancora and nearby beaches begins in mid-July and ends in late October. It is in this period that humpback whales come to the coasts of Peru and Ecuador from the cold waters of the Antarctica, making a long journey of several thousand kilometers, thus giving birth to their young to reproduce. In late October the whales, many of them with two to three babies, undertake the journey back south again in search of polar waters for food. The type of whale that is usually seen is the humpback whale (Megaptera novaeangliae), also known as Yubarta. Sperm whales can be spotted sporadically and even orcas, but infrequently. Other marine species that can be seen, many of them throughout the year, are the delfin comunn (is quite a sight to see hundreds of them sailing with the boat tour! ), Sea turtles (in El Ñuro beach), wolves sea (many of them rest in the oil platforms), as well as birds such as blue-footed booby and frigate birds. If you’re really lucky and you’re on the north coast between July and November, you can see humpback whales from the shore, but not as frequent as you may want to. If you really want to see and even more closely, we recommend taking a tour. There is a possibility that not even see whales on a tour, as largely depends on luck, tour operator and other factors that can not be controlled, however, is not common. Almost always you can see humpback whales in the tours when in season. What steps must be taken before boarding the boat? Children under 5 and adults over 85 years could be exceptions. The tour is for the whole family. motion sickness pills are recommended, not eat much in the morning of the tour and of course sunscreen, hat and a good camera! Have there been accidents between tour boats and whales? Fortunately in Mancora and surrounding beaches have never been reported accidents of this type. Whale watching in their natural habitat requires certain rules so that whales do not feel intimidated by boats, as well as for the safety of passengers on board. Some of these rules are for example not to follow or whales for more than 15 minutes and not be at a very short distance from the animal, among other measures. How long does it take the full tour? The tours vary. It is usually set sail in the morning (7 to 8 a.m. approx.). The tour lasts 2 to 4 hours. In addition to the sighting, some tours include a visit to the oil platforms at the sea (where you can spot sea lions), plus a visit to sea turtles at The Ñuro pier. Some operator tours transfer tourists directly from their hotels or beach houses to the boarding boats or yachts. Which tour operators offer the whale watching tour service? During the whale watching tour it is possible to see these magnificent cetaceans giving spectacular jumps, swimming and diving in groups. It is also possible to see the first games of the young under the watchful eye of their enormous mothers. During this fascinating tour it is also possible to observe dolphins, sea lions, turtles, birds like the blue-footed booby and frigate birds. What will depend on the season. 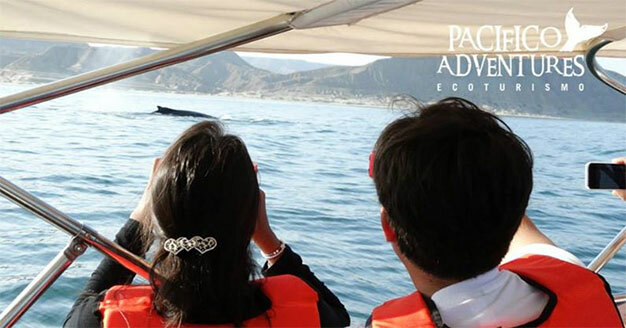 This tour also serves as a research platform for the study being done by marine biologists at Pacifico Adventures. 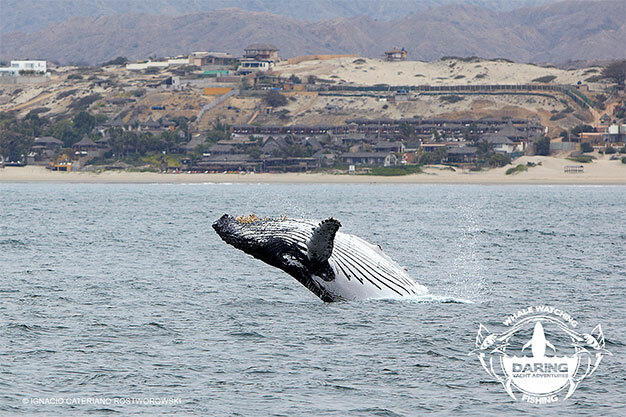 Participates and promotes your visit this important research project developed humpback whales in the northern coast of Peru. Tour duration :3.5 hrs approx. Daring yacht is a 40-foot boat, the latest technology. We have bathroom, kitchen, cabins and all the amenities for a pleasant journey. Our tour lasts 4 hours. We start at 7:00 am from the Pier of Los Organos. Our first destination is the oil platform to observe the sea lions that live there, we continue our journey to humpback whales and enjoyed their jumps, flapping, courtship and its impressive sound emitted into the ocean, because we have a hydrophone. 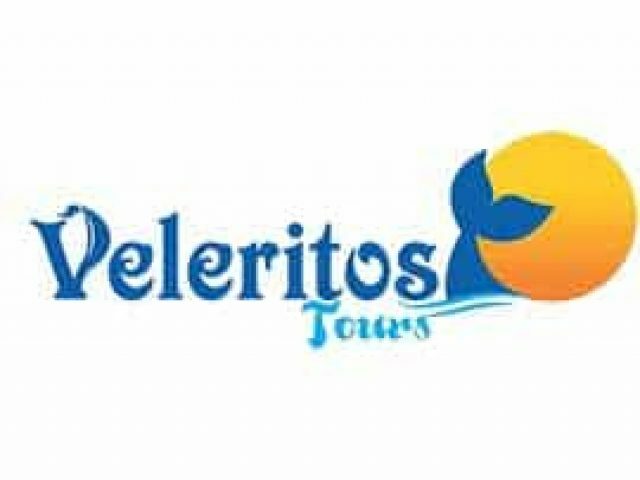 We also have a marine biologist on board to learn and inform behavior and preservation of our marine wildlife, then continue our way up to the pier at El Ñuro inhabited by a large population of sea turtles. We anchored at the dock so passengers can swim and snorkel with the turtles. We end our journey in the spring of organs, making this tour an unforgettable experience.